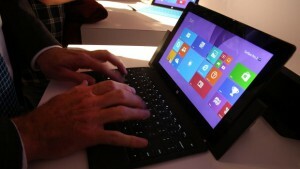 Timewatch CEO Graeme Wright was quoted in the media following the launch of Microsoft’s Surface 2 tablet in New York last Monday. Whoops and hollers from the company’s employees filled the auditorium where Microsoft launched its latest device but Wright told the Sydney Morning Herald that the Surface 2 should be pitched as a tool for business and education rather than a trendy tablet. The Surface 2 – for work or play? Surface 2 comes with “Outlook, ensuring that your calendar alerts are the first thing you’ll see when you sit back on the couch and pick up your tablet,” wrote Slate’s Will Oremus who believes a tablet is for play not work. Graeme Wright, chief executive of scheduling software company Timewatch, agreed with this view but perhaps for different reasons. Wright said Surface 2 should have been pitched at business and education markets. “They are letting everyone compare Surface to an iPad and to a MacAir but it is different,” Wright said. Timewatch CEO Graeme Wright was quoted in the Sydney Morning Herald.